It is said that there are two types of people in this world — the vast majority that enjoy the few fleeting moments that come when they reach important destinations and milestones and the rare and blessed minority that take pleasure in the journey as well. The modern traveler is so often consumed by the sense of ‘reaching a destination’ that he tends to neglect and miss the many wonders that lay in the journey itself. Some of the world’s best roads are so staggering that they themselves are a holiday attraction. Today we’re working on a list to show you some of the most amazing roads that one must drive on, at least once in their lifetime. We reckon we must have missed a few great one, but we bet that these 10 are the icing on the cake. Enjoy the ride! 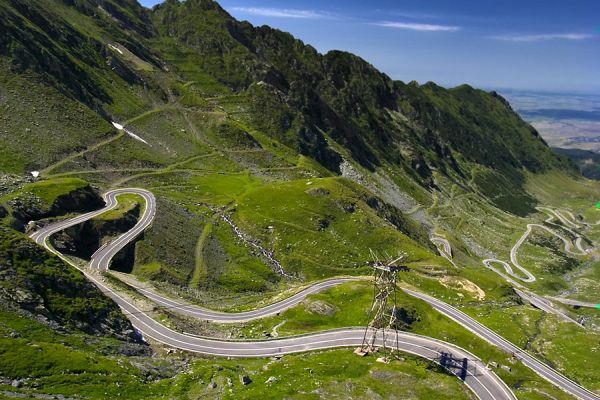 Considered by many auto enthusiasts as one of the best roads in the world to drive on, Transfagarasan Road in Romania is the second highest paved road in the country and definitely one of the very best in Europe. Running between the highest peak in the country, Moldoveanu, and the second highest, Negoiu, the road winds through the breathtaking Carpathian Mountains and the stunning scenery here is sure to set your pulse as well as your car racing. The road provides access to the beautiful Balea Lake and passing through Transylvania means you might drive right past Count Dracula himself! 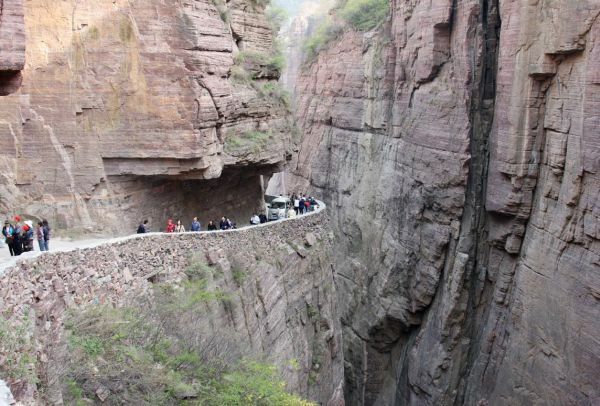 If you are looking for an adventure of a lifetime and a road that can offer it, then the Guoliang Tunnel Road is a nice place to start. The road is more like a little cavern on the side of a mountain. With over 30 rock windows all around, you are given a glimpse into a bottomless pit that is both frightening and exhilarating. The villagers on the other side of the tunnel built this road all by themselves and the 1200-meter long tunnel in Taihang Mountains in China is both unique and inimitable. Locals call the North Yungas Road in Bolivia as El Camino de la Muerte and that pretty much translates to the ‘road of death’. If China’s Guoliang Tunnel seemed dangerous, then this is simply a journey that is out of this world. If you do come out of it unscathed, then you should be thanking your lucky stars. 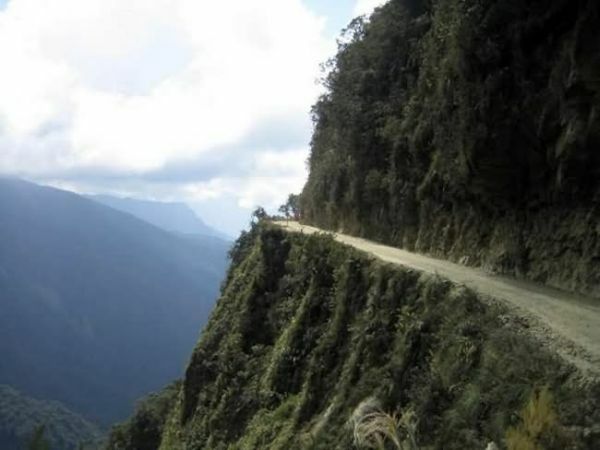 The road connects La Paz to Coroico and is one of the few roads in Bolivia that connects the Amazon Rain Forest region with La Paz and the 63 kilometer journey on this crumbling and barely safe road is inarguably the most daring drive on the planet. The Stelvio Pass in the Italian Alps is considered as an amazing road to drive on as well, but the riches of the Amalfi Coast are simply staggering and unmatched. 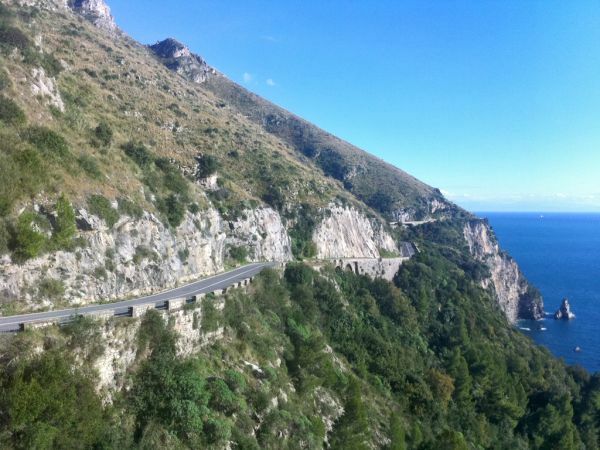 Unlike the more dangerous roads on the list, a trip on the Amalfi Coast is all about wind in the hair as you let down you guard and have romantic sunsets, tantalizing cuisine, great coastline and Italian charm being all served up as one single package. It is all about Italian charm at its mesmerizing best! Norway seems to be one of the hottest destinations when it comes to great roads and if you love to rent a car and hit the roads in an exotic foreign land, this is the place to be. While Norway can have its own list of amazing top 10 roads, the Atlantic Ocean Road has a real special place as it stands out from the pack. The 8 km stretch of road between Molde and Kristiansund was voted as the Norwegian construction of the century. Its undulated form and curves are as vibrant as the lakes and mountain ranges that surround it and on a day with rough weather you can see the water crashing in into its banks creating a thrilling driving experience. Welcome to Middle Earth! If you are a fan of Lord of The Rings Trilogy, then this will be the most exciting ride on the planet for you. 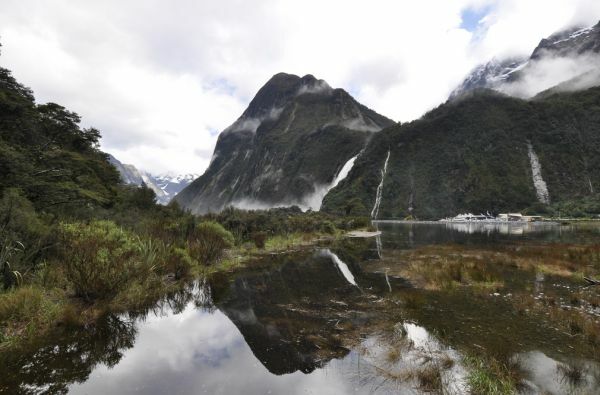 If you are not, it still will be arguably one of the best roads to travel on and that is how beautiful the ride from Te Anau to Milford Sound in New Zealand is. There are many roadways in the country that will simply transport you into another world that has been lost in time and untouched by the hassles of modern life and this one not only promises a breathtaking journey, but also a stunning destination. Thick rainforests, pristine lakes, great mountains, green canopy, magnificent cliffs and unending tunnels are all packed into one here. 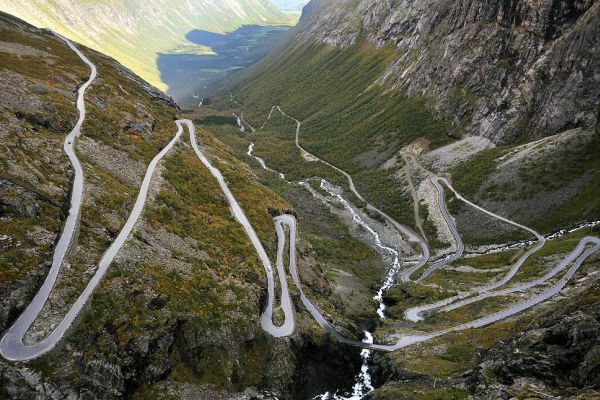 If you are looking for serpentine roads that wind up and down giving some really difficult hairpin turns to negotiate, the Trollstigen in Norway is the best place to be. As popular a tourist attraction as the great Norwegian Fjords, the road in Rauma, Norway sees as many as 2500 vehicles passing through on a daily basis. There are plenty of facilities for tourists here and even a museum for you to enjoy once you get to the top. But what you will be more interested in is obviously the road you have taken to get to its peak. While driving on this narrow road can be a bit tough at times, it is worth all that effort and a whole lot more. Beautiful curves engraved on the mountainside! A 243-kilometer ride between Torquay and Warrnambool allows you to really take in Australia and what the Outback has to offer. You can experience a plethora of sights and understand what it is to be an Australian in spirit. From rainforests to riding next to the ocean, from jaw-dropping cliffs to national parks, from great wildlife to captivating flora, this long ride has it all bundled into one. You will come across all the wild variations of this continent-country, with its great surfing spots, restaurants and beaches all along the journey. The Great Ocean Road promises a fun and fascinating family holiday. The highest paved road in South America must really make the list and it does! While not many people know about Ticlio Pass in Peru, the 132 kilometer road at 4,877 meters above sea level offers a driving experience that is similar to nothing else. The spectacular and imposing Andes look down upon you all the time while sweeping turns, ‘not as stable’ patches on the road and potential risk of boulders simply rolling down from the sides makes this road journey ‘breathless’. You will be struggling for breath completely at this altitude. If there was ever a road that led to ‘heaven’ then this is it and the starry night sky here is a sight to behold thanks to thin air and lack of any pollution. The Ticlio railroad is also a stop worth seeing as you take in the splendor of the Andes. 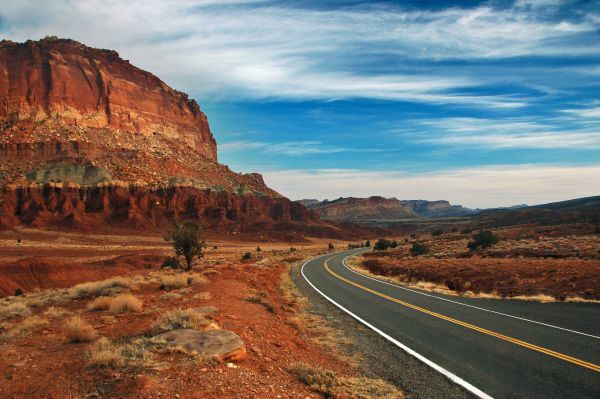 Finally, we are back in the US and for those who wish to explore one of its more scenic routes the State Route 179 or Red Rock Scenic Route is a fine choice. Apart from the mesmerizing Red Rock Country that you will drive through and most likely slow down to take a longer look as you are stuck by sheer awe, there is also the prospect of Coconino National Forest and Montezuma Castle National Monument along the way. i saw this top on carsroute.. months ago maybe.. Some Incredible pictures here. 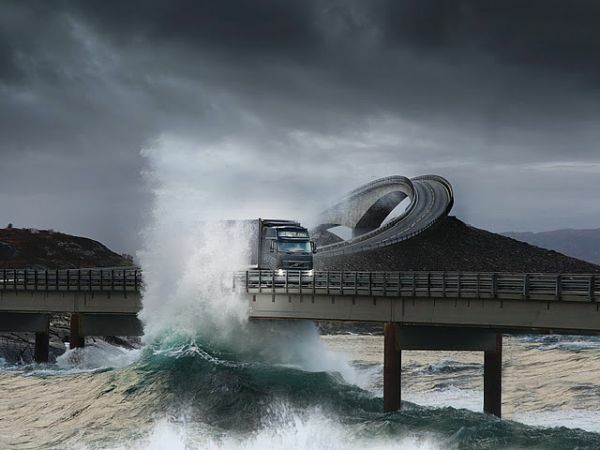 i found Atlantic Ocean Road more beautiful but North Yungas and Guoliang Tunnel Roads looks so dangerous. Hello! Fine post! Please when we can see a follow up!